At YESS, we are trying to remove as many barriers to services as possible for youth facing difficult realities. Over the years we have learned that putting too many expectations and restrictions on youth can prevent them from seeking supportive help when they need it most. The majority of youth that we see are facing very difficult situations and could be living with traumatic experiences, fear, mental illness, PTSD, organic brain disorder, and community isolation. We know that within days of being on the street, a youth can be quickly swept up into the tight community of a gang or a predator. If we do not act quickly once they are inside our programs and start to create a safe and secure environment for them, they will be entrenched into street life. Response needs to be quick, compassionate, and non-judgemental, and focused on wrapping a warm hug of welcome around these youth, so that they stay and try to work towards healing and safe and appropriate housing. Every youth has a story. And every youth comes to us on a different path, with unique needs. That is why we try to meet youth where they are at. YESS practices harm reduction in our shelters. Youth may be intoxicated when they come to us and we have needle disposal sites at each of our buildings. When we ask and work with a youth to set goals, we work on goals that are appropriate for them. For example, one youth may be ready to try to find employment or go back to high school, another youth may need to get clean through a recovery program, while yet another may need to just work on feeling safe enough to have a conversation with a relative. Meeting youth where they are at also means being trauma-informed. 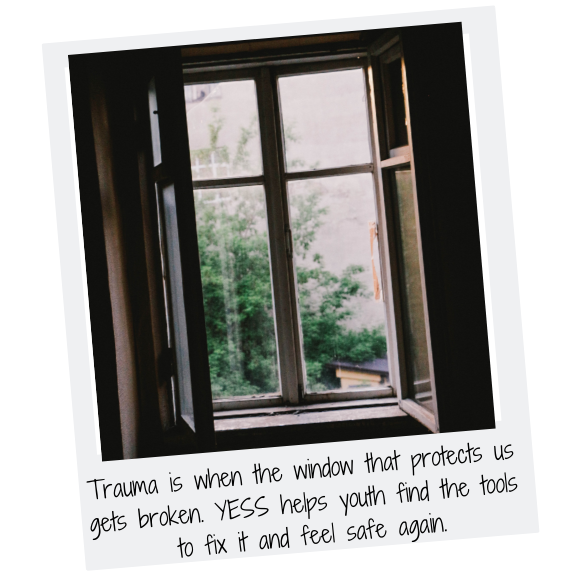 All YESS employees are trained in understanding trauma and its effects on behavior and how we can best mitigate and de-escalate youth who have been upset or triggered by an event or happening. Youth agencies across Edmonton are becoming much better equipped to deal with the trauma that these youth carry with them, and collectively we know that unless we work together to stabilize their housing, integrate them into our neighborhoods, and help them on their healing journey, we will lose them to the streets. Moving forward, YESS will be working more and more collectively with city agencies and funders to ensure that we walk alongside these youth as they heal and build relationships. You can be a part of this. Your generous financial or volunteer support helps us move closer to giving better care. If you are not in a place where you are able to give your time or your money, do me a favor: the next time you see a youth who looks like they might be experiencing homelessness, who might look scared (or even scary), look them in the eyes. Show them that you see them and that they matter. This interview appeared in our Summer 2017 Newsletter. 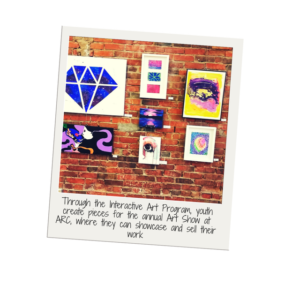 We are re-posting it ahead of Visual Voices: Telling Our Stories Through Art, the YESS Youth Art Show and Sale, opening Thursday, October 19, 2017. Earlier this year we put a call out for a new YESS Artist in Residence with support from the Edmonton Arts Council. Our Artist in Residence leads the Interactive Art Program at ARC. The art program is constantly evolving, but it’s always a favourite with our youth. The Interactive Art Program is proudly sponsored by Simons, who hold the power of art near and dear to their vision. “What resonates with us most at Simons is the ability to contribute in a way that taps into the creative positivity of the youth and help others see the potential,” says Yvonne Cowan, Director of Store Operations for Simons. 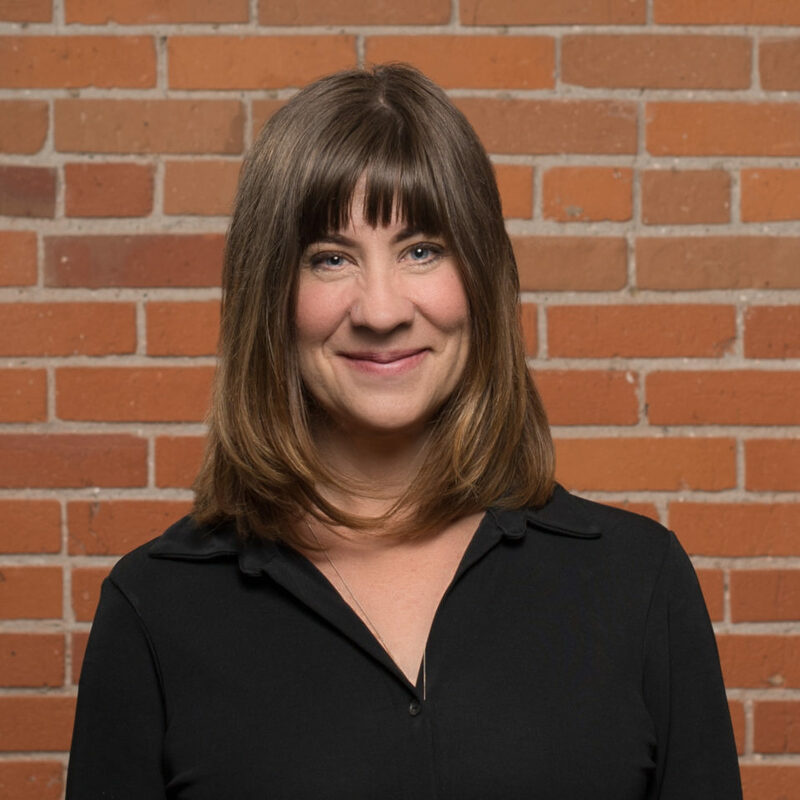 Local artist Allison Tunis was selected to be YESS’ new Artist-in-Residence in the spring. Allison is an Edmonton artist whose work in embroidery and mixed media primarily explores body positivity. She has a graduate degree in Art Therapy and has already worked extensively with youth from difficult realities. 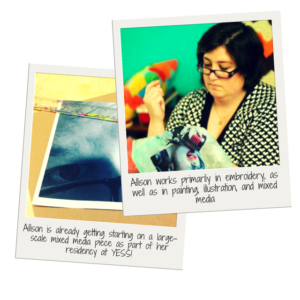 We met with Allison as she began to set up shop at ARC to ask her a few questions. You already have experience with this demographic. What drew you to the artist in residence position at YESS? This position seemed like it was tailor-made for me. I do have quite a bit of experience working with this demographic – I’m trained as an Art Therapist from the Vancouver Art Therapy Institute, and did many of my practicum placements working with youth from difficult realities. When I moved back to Alberta, I worked at the Old Strathcona Youth Society for nearly two years, and participated on the Youth Connect committee and currently work for the Action Alliance for Youth Inclusion (AAYI) group (a local group of non-profit agencies working towards inclusion of high-risk youth) as an administrative assistant. This residency position is a perfect combination of working on my own artwork, and helping youth to use artistic expression in new ways. What are you hoping to accomplish with our youth through the Art Program? Through this program, I’m really hoping to introduce to the youth the ways that Art and Activism can be used as healing tools. This is the basis of my own work – raising awareness of feminist and body diversity issues, whilst working through some of my own history. The skills that I’ve learned as an artist, an art therapist, and an aspiring activist, are very useful in developing healthy coping mechanisms and methods of self-expression, and I think the youth would benefit from exploring different avenues for how art can contribute to their lives. In your opinion, what is it about art that makes it such a powerful medium for therapy? The powerful aspect of art is that it can really be what you want it to be. You can use it as a diary, as a therapist, as a voice to raise awareness, as a form of meditation, and so on. It allows for individuals to engage in a variety of different ways, whatever their comfort level and experience level is. As well, regardless of what most people think, artistic skill is not required for making art. It’s accessible to everyone. The benefits of art don’t just magically appear if you are able to produce realistic looking portraits, they are there if you are doing abstract expressionism, if you are finger painting, if you are embroidering, if you are colouring in colouring books. Art can be something different for each person, and it can be a very powerful way of expressing what’s inside when you are unable to put it into words. Is there a particular project or art style that you’re most excited about sharing with our youth? 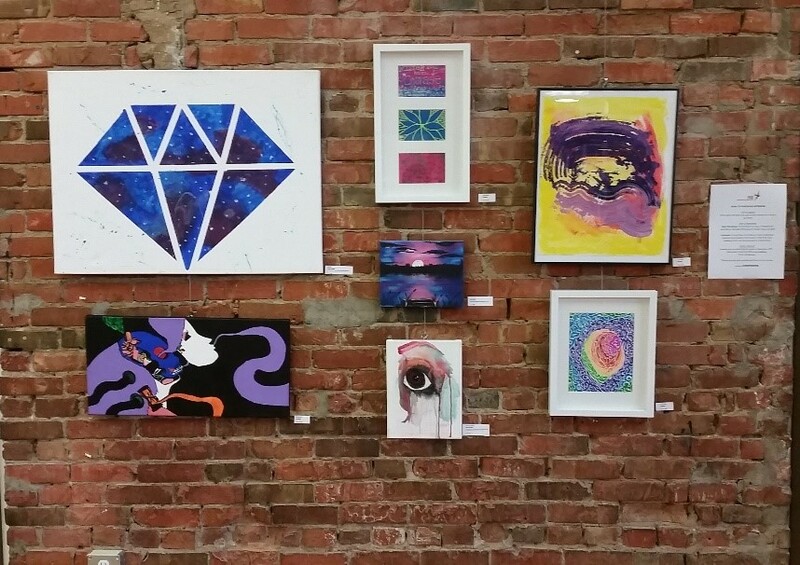 I’m really interested in sharing that art doesn’t have to be traditional “Art” media with the youth. I work mostly in embroidery, which is a traditional craft medium and not usually considered Fine Art. I’d like to show the youth that their skills and histories can be used to make unique art, whether it’s repurposing items they find out in the world, or beading techniques that they learned from their family. I’m also thrilled that there is a high chance that we will be creating a colouring book with the youth, which is something that I have done in the past and am happy to pass on to the youth. 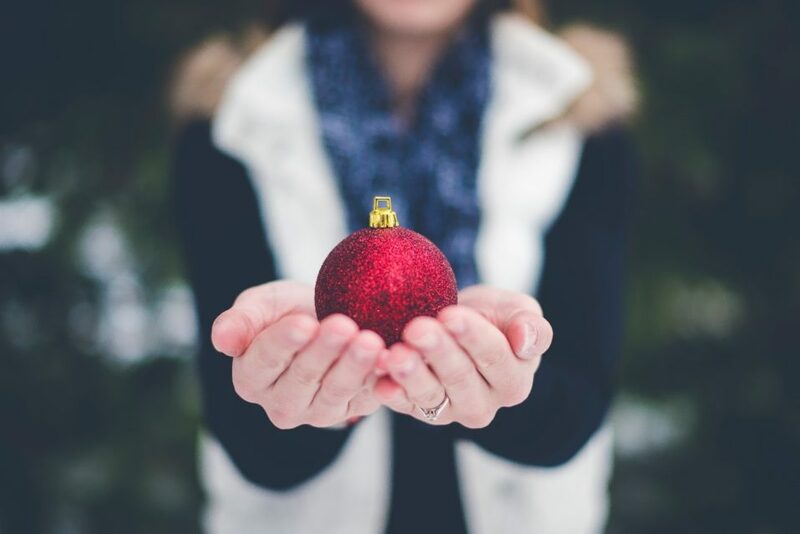 Gifts In Kind: Where Do Your Donations End Up? Giving back is simple. It starts with a decision to just lend a helping hand to someone in need. Maybe you saw a story on the news saying that a local charity was low on food donations so you started collecting cans of soup from family and friends to help restock the shelves. Or maybe you finally outgrew a beloved, comfy hoodie and you just wanted to pass it along to keep someone else warm. Whatever your reason for taking the step to donate, we’re really glad you did! Here at YESS, the two most common types of donations we are gifted with are what we call “monetary donations” and “in kind donations.” Monetary donations are just that – donations in the form of cash, cheque, or an online process. In kind items, on the other hand, are donations of tangible goods – like food, clothing, toiletries, or gifts for the kids to enjoy, like a video game. So what exactly happens to these donations after they are dropped off at YESS? The process begins with our facilities team. They carefully sort all of the items, going through boxes of food, bags of donations, and trunks full of stuff. Our facilities team sees everything from boxes of socks and deodorant, to strange items like cans of paint and leg braces. Things like toothbrushes, deodorant, makeup, personal hygiene products, razors, soap, and clothing make their way to our donation room. Many kids come to us with only the clothes on their backs. These kids will visit the donation room and carefully flip through hangers of donated clothing. Some will need an entire set of clean clothes, others may just need a dressy shirt for a job interview. Food donations are sorted by our kitchen team, who decide what items need to be used right away and what can go in the fridge or freezer and added to the menu later in the week. Food is then transported to one of our three buildings – our Whyte Avenue building, which houses our Nexus Emergency Shelter and Graham’s Place; the Armoury Resource Centre, where our daytime programming takes place; or to Shanoa’s place, our residential home in west Edmonton. Things like cereal, soup, pasta, canned meat, jams, crackers, granola bars, sauces, and other snacks end up on our pantry shelves. Perishable items like milk and meat end up in one of our oversized fridges or freezers. And what exactly happened to that can of chicken soup you dropped off? 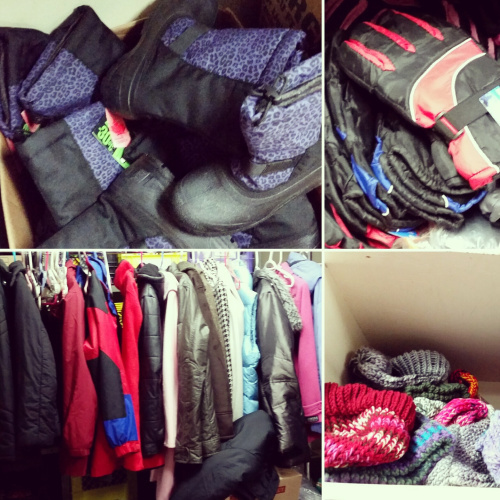 It was warmed up and placed in the ice cold hands of a youth who had nothing but tattered mittens to wear on the harsh winter streets, and with it came nourishment, comfort, and strength. You can be assured that every donation, big and small, is loved and appreciated at YESS. Your ticket for the: Gifts In Kind: Where Do Your Donations End Up?